The United States chemical weapons stockpile served as an important deterrent for more than half a century, but by 1985, with the rise of international concern regarding the effects of chemical warfare, Congress directed the Army to destroy the stockpile. The Program Manager for Chemical Demilitarization (PMCD) was the organization formed by the Army to carry out this mission. At the time, the only proven chemical weapons destruction technology was incineration. As plans for the destruction of the stockpile were developed, environmental organizations, community members living near stockpile sites, and government regulatory agencies began discussing other means by which the stockpile might be destroyed. In 1996, in response to these discussions, Congress established the Assembled Chemical Weapons Assessment program, known as ACWA, under Public Law 104-208 to identify and demonstrate at least two technologies as alternatives to incineration for the destruction of assembled chemical weapons (assembled chemical weapons meaning munitions containing chemical agent configured with fuzes, explosives and propellant). In its initial 1996 law, and again in follow-on legislation two years later (Public Law 105-261), Congress directed that the ACWA program be conducted independently from the Army’s chemical demilitarization effort under PMCD, and further stipulated that the ACWA program manager report directly to the Office of the Secretary of Defense. Upon ACWA’s successful demonstration of several alternative technologies from 1997 to 2000, the Department of Defense selected neutralization followed by biotreatment for destruction of the stockpile at the U.S. Army Pueblo Chemical Depot in Colorado in 2002, and neutralization followed by supercritical water oxidation in 2003 for the stockpile at the Blue Grass Army Depot in Kentucky. Legislation subsequently passed by the Congress in 2002 (Public Law 107-248) assigned responsibility to the ACWA program manager for the safe destruction of both the Colorado and Kentucky chemical weapons stockpiles, to include pilot plant construction, operation, closure and the awarding of all associated contracts, thus dual-tracking the national chemical demilitarization mission between PMCD and ACWA. PMCD would be responsible for destroying 90 percent of the stockpile and ACWA, 10 percent. 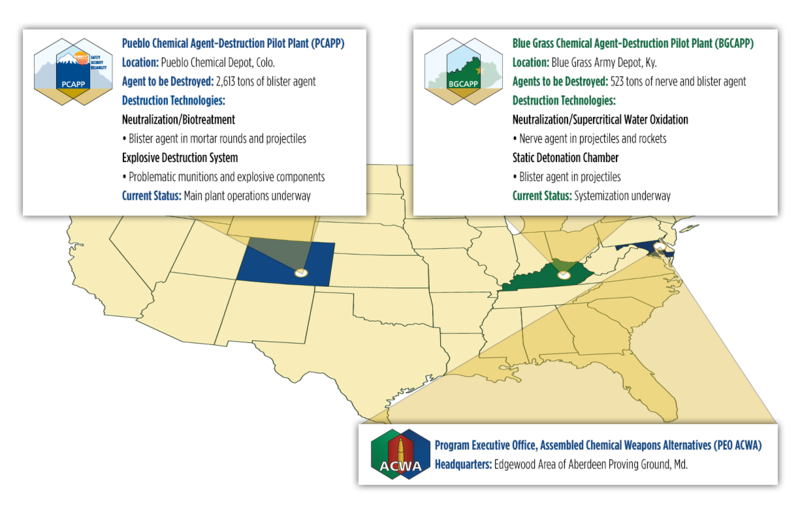 ACWA’s expanded mission resulted in a name change from “Assembled Chemical Weapons Assessment” to “Assembled Chemical Weapons Alternatives” in June 2003. Late in 2002, ACWA awarded a task-order systems contract to the Bechtel Pueblo Team to design, construct, systemize, pilot test, operate and close the Pueblo Chemical Agent-Destruction Pilot Plant (PCAPP) at the U.S. Army Pueblo Chemical Depot in Pueblo, Colorado. A similar task-order systems contract was awarded to Bechtel Parsons Blue Grass in 2003 for the design, construction, systemization, pilot testing, operation and closure of the Blue Grass Chemical Agent-Destruction Pilot Plant (BGCAPP) at the Blue Grass Army Depot in Richmond, Kentucky. In 2003, ACWA’s sister organization, PMCD, was redesignated U.S. Army Chemical Materials Agency or CMA. In addition to retaining its responsibility for chemical stockpile destruction at the sites other than Colorado and Kentucky, CMA was given authority over the safe and secure storage of the entire chemical weapons stockpile, to include those weapons stored in Colorado and Kentucky. On Sept. 18, 2004, ACWA held a groundbreaking open house to celebrate Stage One construction at PCAPP. Soon thereafter, design of processing facilities and Stage One construction were temporarily suspended while the program evaluated cost reduction measures. In March 2005, design and construction of PCAPP officially restarted. In 2006, BGCAPP broke ground on its chemical demilitarization facility, signaling the start of construction in Kentucky. In November 2007, ACWA was formally activated as the U.S. Army Element, Assembled Chemical Weapons Alternatives, a separate reporting activity under U.S. Army Materiel Command. Under this arrangement, ACWA received administrative and logistics support from Army Materiel Command, but the ACWA program manager continued to report directly to the Department of Defense as required by Public Law 105-261. Effective Oct. 1, 2012, ACWA was redesignated Program Executive Office, Assembled Chemical Weapons Alternatives and administratively reassigned to the U.S. Army Acquisition Support Center. This transition was directed to raise the program’s visibility and obtain necessary support and resources. As mandated by law, the program’s direct reporting connection to the Department of Defense remains unchanged. Also in 2012, PCAPP marked the end of site construction. In 2013, Explosive Destruction Technologies were selected to augment PCAPP and BGCAPP by destroying problematic chemical munitions stored at the depots. Problematic munitions are those that have leaked in the past and are now overpacked and projectiles whose physical condition does not easily allow for processing by the plants’ automated equipment. The Explosive Destruction System (EDS) was the Army system selected to destroy approximately 0.2 percent of the total Pueblo chemical weapons stockpile. Komada LLC, a Colorado Springs-based contractor began construction on the PCAPP EDS site in March 2014. The Static Detonation Chamber (SDC) was the technology selected to destroy the entire mustard agent stockpile in Kentucky. Construction on the SDC began in December 2014. In June 2014, the PEO ACWA Anniston Field Office was established to ensure that the technical expertise and experience of the staff at the former Anniston Chemical Agent Disposal Facility (ANCDF), as well as the facility’s SDC, is preserved and available to be leveraged during chemical weapons destruction in Colorado and Kentucky. ANCDF, one of seven CMA sites, finished safely eliminating the chemical weapons stockpile at the Anniston Army Depot in September 2011. The Pueblo plant began operations on Sept. 7, 2016. The plant began destroying the stockpile of chemical weapons stored at the U.S. Army Pueblo Chemical Depot in Colorado. The plant is utilizing neutralization followed by biotreatment as the technology to destroy munitions containing more than 2,600 tons of mustard agent. Additionally, the Army’s Explosive Destruction System, or EDS, is on stand-by to augment the main plant to destroy problematic chemical munitions that cannot be easily processed using its automated equipment. The EDS successfully completed its first campaign on Feb. 11, 2016, and eliminated a total of 560 problematic munitions and Department of Transportation bottles in advance of operations at the main plant. In September 2017, the first full year of the pilot testing phase was completed at PCAPP. 253 U.S. tons of mustard agent and 42,897 155mm projectiles were destroyed at the plant. On Sept. 8, 2017, agent destruction operations were paused at PCAPP due to higher than anticipated amounts of solids being washed out of munitions and clogging agent neutralization systems. On Feb. 15, 2018, PCAPP ordnance technicians reached a plant milestone when the last of more than 28,000 105mm projectiles went through Baseline Reconfiguration. On June 13, 2018, PCAPP resumed operations. By July, the BGCAPP systemization team turned over more than half of the 59 Blue Grass plant systems to operations. On Nov. 13, 2018, PCAPP staff initiated Integrated Facility Demonstrations. These demonstrations will show the plant is operating as designed, which is the final step before the plant can move from pilot testing to full-scale operations. For additional program achievements and milestones visit our Program Timeline page. For questions, call the Program Executive Office, Assembled Chemical Weapons Alternatives Public Affairs Office at (410) 436-3398. Safe, secure destruction of the chemical weapons stockpiles is our number one priority. Our goal is to involve stakeholders at all levels in a manner that meets their specific needs. A program cornerstone is openness and honesty. Economical and conscientious use of taxpayer dollars is imperative. We vest authority commensurate with responsibility. We value willingness to meet and conquer challenges through perseverance. We value an inclusive culture based on diverse backgrounds, experience and views.